Member States enthusiastically endorsed a renewed vision for partnerships for health in the WHO European Region on the final day of the 67th session of the WHO Regional Committee for Europe (RC67). The Region’s plan for implementing the WHO programme budget for 2018–2019 was presented on Day 3 of RC67. Member States expressed their full support to WHO/Europe for the 2018–2019 priorities. They noted with satisfaction the emphasis on noncommunicable diseases, health systems and the WHO Health Emergencies Programme. Member States also commended WHO/Europe for its continued efforts to strengthen accountability and integrated monitoring of the technical and financial implementation of the programme budget. Delegates raised concerns over the decrease in flexible funding available to WHO/Europe in 2016–2017, and the uncertain outlook for funding the programme budget for 2018–2019. WHO/Europe will provide Member States with further updates on the funding situation in future sessions of its governing bodies. The first agenda item of the final day of RC67 was partnerships for health. The session opened with a Voices of the Region video featuring Mr Priit Tohver, a medical student from Estonia. Mr Tohver is the European Regional Director of the International Federation of Medical Students’ Associations (IFMSA), a non-state actor (NSA) in official relations with WHO. He highlighted the importance of partnerships in reaching the Sustainable Development Goals (SDGs), and of having a strong civil society that speaks with one voice – including at Regional Committees. Ms Leen Meulenbergs, WHO Representative to the European Union and Executive Manager for Strategic Partnerships and Resource Mobilization, provided an overview of the partnerships in the Region. She highlighted a new focus on transformative partnerships, which strengthen work with partners at intraregional, regional, national and subnational levels, in line with the implementation of the 2030 Agenda. Participants in the session also discussed a new regional accreditation procedure applicable to NSAs not in official relations with WHO. This is one element of the implementation of the Framework for Engagement with Non-state Actors (FENSA) in the Region. Estonia, speaking on behalf of the Region, welcomed the implementation of FENSA and requested a change in the wording of the proposed accreditation procedure. The IFMSA welcomed WHO/Europe’s partnership approach, and supported the possibility of NSAs not in official relations with WHO attaining equal access to Regional Committees through the proposed accreditation procedure. The resolution was then adopted. Delegates had the opportunity to respond to progress reports on the implementation of the European action plan to reduce the harmful use of alcohol 2012–2020 and the European food and nutrition action plan 2015–2020. The delegate from the United Kingdom explained that the country has adopted a childhood obesity plan, which will soon include a levy on soft drinks containing 5 or more grams of sugar. This has led manufacturers to adjust the amount of sugar in their products; it is anticipated that 40% of drinks that would have previously been above the 5-gram threshold will be below it before the levy is introduced. The Government plans to use the revenue from the tax to promote physical activity and nutrition. A delegate from Estonia noted that the European Region still has the highest level of alcohol consumption among WHO regions. It plans to focus on this issue during its Presidency of the Council of the European Union, paying particular attention to intercountry cooperation on cross-border alcohol policy issues and efforts to curb exposure to alcohol marketing through new media. Dr Gauden Galea, Director of the Division of Noncommunicable Diseases and Promoting Health through the Life-course, underscored that WHO/Europe will continue its work in this area and will work with the Estonian Presidency on these issues. The IFMSA and the International Society of Nephrology also made statements pertaining to alcohol use and nutrition. Member States also reviewed matters arising from the resolutions and decisions of the Seventieth World Health Assembly and the 141st session of the WHO Executive Board. These pertained to topics such as the global response to vector control; cancer prevention and control in the context of an integrated approach; and the Global action plan on the public health response to dementia 2017–2025. RC68 will take place in Rome, Italy, on 17–20 September 2018. RC69 will take place in Copenhagen, Denmark, on 16–19 September 2019. RC70 will take place on 14–17 September 2020. On behalf of all Member States, the delegate of Finland thanked the Hungarian Government and the Ministry of Human Capacities for hosting RC67, as well as the Regional Director for her dedication and support throughout the year. Quoting the saying “Omnes viae Romam ducunt” (All roads lead to Rome), the delegate of Finland expressed her hope to see delegates once again at the 68th session of the Regional Committee in 2018. 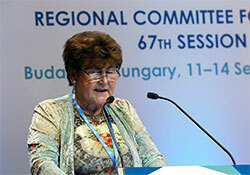 The Regional Director also voiced her deep thanks to all delegates for the discussions and agreements that were reached at RC67, in a spirit of partnership and consensus. At the first session of the Twenty-fifth SCRC, members shared their reflections on RC67 and noted with appreciation the high-level political participation. They also began considering the agenda for RC68. The SCRC will meet again in Tbilisi, Georgia, at the end of November 2017. This briefing, held on Day 3 of RC67, informed Member States about the ongoing collaboration between WHO/Europe, the European Commission and the OECD, and the opportunities identified to further advance their cooperation. Member States provided feedback on what aspects of this collaboration they find most useful. The 3 organizations outlined their work on health information and reporting. The co-chairs of the European Health Information Initiative (EHII) – the Netherlands and the Russian Federation – presented country perspectives and emphasized the importance of EHII as the platform for engagement on health information and reporting. Subsequent discussions highlighted the importance of each organization collecting and making data available, while collaborating to reduce the burden of reporting on Member States. In addition, participants noted that the information collected and published should be useful, meaningful and not conflicting. The Chair invited Member States to join EHII in order to ensure that interests and feedback from all European Member States are included in efforts to coordinate health information in the Region. Member States expressed strong satisfaction with the level of collaboration, and appreciation for the efforts to reduce the reporting burden and harmonize and integrate health information in Europe. Technical briefing on big data – big opportunities or big noise? This technical briefing set out to discuss the strategic role of big data as a data-driven approach to facilitate health decision-making and strengthen evidence for policy-making. Mr Gergely Vartus, Ministerial Commissioner for eHealth Coordination in Hungary, chaired the briefing. Dr Claudia Stein, Director of the Division of Information, Evidence, Research and Innovation at WHO/Europe, gave opening remarks. An expert panel included representatives from the European Commission and WHO/Europe as well as Hungary, Israel and Portugal. They provided the context for using big data for analysing and optimizing operations within national health systems and were unanimous in suggesting that a more relevant definition of big data in a public health policy context was needed. They also outlined the key barriers preventing big data from being used more broadly – specifically security and privacy concerns, and a lack of data integration, harmonization and interoperability. The panellists from Hungary and Israel offered specific examples of how big data is being used in their countries to improve health services delivery and communication; promote prevention; and justify the implementation of more proactive and efficient approaches to managing health, particularly where resources are scarce. The panellist from the European Commission also explained the numerous initiatives, projects and reports that pertain to the use of big data in the European Union. As outcomes of the technical briefing, the WHO/Europe secretariat were encouraged to take forward the development of big data under the European Health Information Initiative (EHII) in particular by defining big data for public health, identifying the relevant users and target groups and defining methods for the application of big data in developing evidence-informed health policy.